Wedding planning is hard work. Drinking wine shouldn't be. We talk to an expert on how to best navigate wine for your wedding, from selections to budget and day-of logistics. Here's your guide to creating the perfect day. Toasts and celebratory glasses of wine are an integral part of any wedding reception. Many couples default to “whatever is cheapest,” but just because you’re on a budget doesn’t mean your wedding wine can’t still have heart and taste great. Here’s your guide to choosing the right wine for your wedding, tips on wedding-day logistics and the ways to get the best bang for your buck. Think back to all the wines you’ve enjoyed as a couple. Is there a particular bottle that stands out from your time together? Do you have a story about that time you tried to get a bottle open without a corkscrew? Or a special vintage you once brought camping? Think back to the first time you cooked together. What did you drink? Look for wines you have a story with or represent important moments along your journey. If you don’t have a relationship with a special wine yet, it’s never too late to start. Make a date out of a trip to a wine bar and take notes together. Start tasting when you go out to eat, and build your knowledge—you may even learn something new about your partner in the process. Be sure to ask your sommelier questions. They can be invaluable sources when it comes to suggestions and pairings. Look to friends and family for advice as well. Perhaps someone you know has frequented a specific winery for years and has a connection with the winemaker. Visiting wineries and tasting rooms can help relieve the stress of wedding planning while also introducing you to new options. You might also develop a beneficial relationship with a local winery in the process. As you consider grapes and vintages to be served with dinner, remember to pair the meal, not the individual dishes. Is it rich with cheeses and meat, smoky barbecue or citrusy fish? It’s fine if every bite isn’t a perfect match for each sip. You’re seeking longevity here. Can the wine last all evening or are the flavors so strong guests may want to quit after a single glass? Be careful when choosing a wine with big tannins or one that’s high in alcohol. Also, think of your wedding colors if you’d like a glass worthy of Instagram (wedding pictures are forever, after all). Try pours outside of the expected red and white varieties, like an orange wine, rosé or vin gris. How much wine should you get? This is a conversation to have with your caterer. Nothing can bum a party out more than running out of vino. You know your friends and family. Who’s going to get wild, and who will abstain? Figure out the minimum glasses per person, and then calculate the maximum. You now have a range to compare against your budget. A good tip is to budget for your maximum, but ask your caterer if you can only be charged for what is opened. Some will be inflexible, but many vendors will take whole unopened cases back. If you purchase by the case, inquire about bulk discounts and don’t forget to calculate shipping. Even better, look for local wineries where you can pick up everything. It’s also fine to mix and match—not every guest has to drink what you drink. If you want a bottle of Champagne for you and spouse, or a special case for the bridal party, don’t feel bad about treating yourselves. Another way to stretch your budget is to create a batched wine cocktail, spritz or punch. Sangria is a popular choice, and it can be easily personalized with your favorite fruits, spices or ingredients meaningful to your relationship. Is apple-picking a yearly tradition for you and your spouse? Does a particular spice remind you of your trip to India? Make it a part of your cocktail. For an easy crowd-pleaser, try white sangria with Cava and aromatic green Anjou pears in the summer, or a warm cup of mulled wine with star anise in the winter. Sparkling wines like Prosecco or Crémant can be cost effective, and their brightness will help wipe greasy foods off the tongue. Also, while it may go against fancy wedding convention, don’t fear the boxed wine. There’s an increasing amount of classy and delicious brands available. If your future mother-in-law hates the idea, have the bartenders serve them in carafes. Your guests will be none the wiser. Picking wine is the fun part. Logistics? Not so much. Once you’ve decided on wine, talk to your caterer about how best to serve it. You may need to file for a special permit to serve alcohol, depending on the venue, so be sure to ask. At minimum, create a map of the space with the locations of bars, restrooms and exits marked. And make sure to check with your venue to confirm everything is insured. Often overlooked, your venue may not handle recycling themselves. Wine bottles take up a lot of space. Discuss trash disposal and storage for during and after the party. You don’t want a staff member dragging a wet, clanging bag of bottles across the dance floor. Renting glassware can get expensive, and it’s a virtual guarantee that at least one will break. Budget for these mistakes, but you can curb them by creating fun stemware tags to encourage guests to carry glasses with them. Think about key moments to serve wine. Your bartenders need to know when to pre-pour for an onslaught of guests. Anticipate and reduce lines at the bar. A little wine before the ceremony can calm nerves, but also runs the risk of your guests tiring earlier. It’s a classy touch to have pre-poured glasses waiting at the reception venue, but be prepared to pay for extra staff to pull it off. For DIY celebrations, a self-service bar or large glass jugs with spigots can cut down on labor costs. Creative options like bathtubs, wheelbarrows and galvanized buckets filled with ice at backyard receptions have all been used. 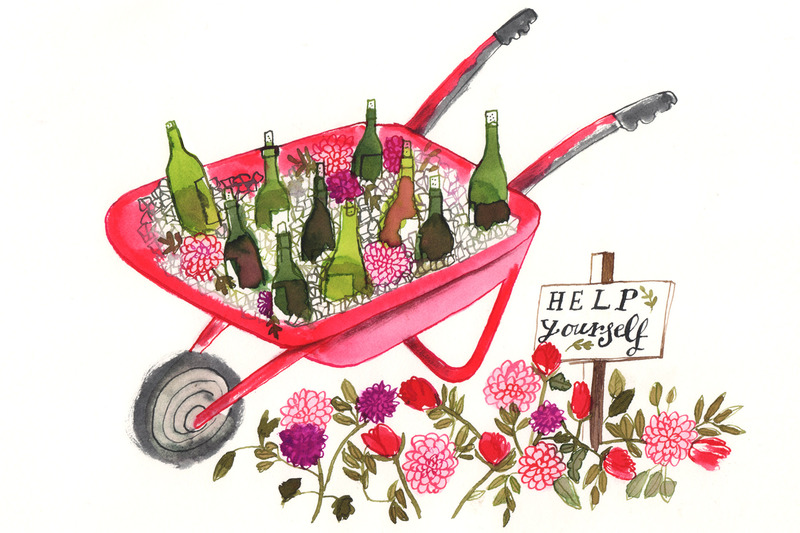 Create signage that explains clearly, “Help yourself,” and make sure the wine key is easy to find or attached to the table with string. Ultimately, the wine should be something you and your loved ones enjoy. It’s only one element of the best day ever. Here’s to you! Need help your narrowing choices? Tag @WineEnthusiast and @Randwiches on Twitter with your questions. Already married? Tell us what wine(s) you chose and why. We’d love to hear your story. Jenn de la Vega is a writer and caterer based in Brooklyn, New York, and author of Showdown: Comfort Food, Chili and BBQ.